One of the exciting parts of leading the growth of a new business category is the innovative ideas the market creates that we never expected. When we launched LevelEleven, it was very much about taking the oldest sales motivation trick in the book – the sales contest – and making it more impactful with real-time results and easier to manage with automation. 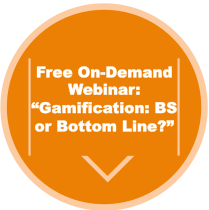 Along the way, our clients have come up with some remarkably creative ideas for using sales gamification that are really making a difference. Cardinal Health wanted to onboard new sales reps quicker, so they ran a simple leaderboard around opportunities created within two specific product lines. The key was that the two product lines were relatively easy to understand for a new rep and had high value to prospects. They were able to create some early momentum to get the new sales reps off to a fast start. Digital engagement pioneer HelloWorld had a new mobile product that wasn’t getting much attention from the 100+ person sales team. The product was launched with great fanfare, training and marketing, but reps just weren’t talking about it with customers. It’s hard to learn something new. So they launched a simple leaderboard that rewarded reps just for pitching the concept to a prospect. They created a hashtag to put in the event when logged in Salesforce: #mobile. Pitches for this new product increased 2x, and sales for the product increased 230%, which held strong well after the competition ended. Plus, because the results were shared publicly and in real time, salespeople collaborated more with each other to learn how others were finding success. We’ve heard this one numerous times, and it’s a personal favorite. Check out your sales process to understand win rates by sales stage. For example, we know that once an opportunity moves to stage three of the sales process our win rate doubles. (If you need help finding yours, there are great and simple tools like this one from InsightSquared.) Then run sales contests that trigger points when an opportunity moves to one of those key stages. We’ve seen many clients do this; it keeps their sales stage data accurate, and more importantly, gets those opportunities advancing. Ever look at your open opportunities and see little (if any) activity logged against them? Some of this is simply because the activity isn’t being associated with the opportunity in Salesforce, or whichever CRM you use. Some of it is general inactivity. Run a simple competition that rewards points for logging activity against opportunities. If you want to get fancy, you can even tailor it around certain types of opportunities, such as upsell opportunities, opportunities with key accounts, opportunities over a certain deal size, etc. This has been one of the most common and successful use cases. Got a product that you want to see more movement on – maybe because you’re trying to get rid of excess inventory, or just want more focus on a highly profitable service? Create energy with leaderboards specifically focused on that product. Our client the Detroit Pistons did this and drove $500,000 in product sales in 6 weeks. Stanley Black & Decker did the same thing in only 2 weeks. Salespeople are hyper motivated by competition, because it gives them an objective measure of how they’re doing relative to their peers. When they know this, they know what to focus on, and what we’ve found is that they start naturally seeking out their peers asking for tips and tricks. Keeping a sales team focused on prospecting day-in and day-out is often a challenge, as it takes daily discipline. Typically salespeople prospect when they realize their pipeline is looking light and then slow down when the pipeline is looking robust. Many of our clients run daily “Power Hours” that include everyone on the team. Each session is a 60-minute blitz, pre-planned so people block off the time on their calendars. And because results are shared in real time and often in public locations like TV’s in the office, it rallies the team. Missing some key data about your business? Some common ones I hear about are blank industry fields, old close dates or competitive presence on an opportunity. Managers will often ask in weekly sales meetings for everyone to prioritize this, but it never seems to make it to the top of the list for those salespeople. Quick burst contests and leaderboards that reward points every time these items get updated can have rapid impact. We’ve seen thousands of records updated in a matter of days, simply by tapping into salespeople’s competitive nature. Are you trying out gamification or using leaderboards within your sales team? What innovative ideas do you have to share? Sales gamification means more than using a traditional sales contest to motivate deals closed. Take these 9 innovative use cases, for example.